For over four decades I have had the wondrous privilege to help coach high school distance runners. I have seen all types of runners over the years. Some have committed themselves to being the best they can be, some have given a half-hearted effort, and some have been social athletes who simply came out because they desired to be with their friends. Regardless of those I have coached, I trust they all have learned to some degree that the principles of commitment and dedication they gained from running will in the future serve them well in other areas of their lives. Every once in awhile a runner comes along that makes a lasting impression upon me because they exhibit that extra “something” that distinguishes them from others. They possess the heart of a champion. My list of those types of runners is a most exclusive club. 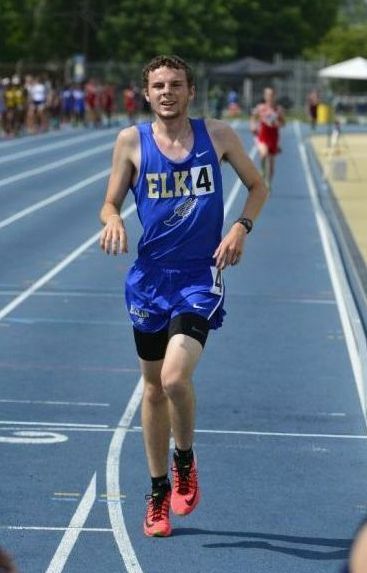 As the 2016 track season has come to a close one young man whose name has been added to the list of those who possess the heart of a champion is Elkin’s Jacob Parker. On Friday, May 20, Jacob ended his high school track career by capturing the silver medal in the 2 mile at the NCHSAA 1A State Track Championships. In the four years I have coached him he has been an example of what it means to run with the heart of a champion. Little did I know I was about to embark upon a journey that was both challenging and most rewarding. Over the years I have had some hard workers who sought to achieve their best and Jacob quickly moved toward the top of that list. From day one he exhibited the heart of a champion. He could be stubborn, but most good runners are. However, Jacob’s inner engine and will to achieve was often more powerful than his muscles and his immune system. I at times had to adjust his training to avoid injury because his muscles and connective tissues would rebel if adequate recovery days were not properly inserted between hard workouts. Always giving me 100% when he trained and raced, his immune system at times would betray him and sickness would occur. As an example, at the beginning of his junior year he became so weak from a virus that attacked his system, for almost two weeks he could barely walk much less run. If I had been a betting man I would never have believed he would have had a cross country season. But possessing the heart of a champion he battled back to lead the Elkin xc team to capturing the 2014 MVAC Conference Championship and qualifying for the State Championships, and individually earning All-Conference and All-Regional honors, and running an exceptional 16:22 5K by season’s end. Astounding for a kid who only eight weeks before could not walk without assistance. But he has the heart of a champion. Also, during his junior track season (2015) he battled IT Band Syndrome and there were days he could barely workout. But on meet days he exhibited the heart of a champion and ran with guts and determination that defied explanation. By year’s end he had captured 2 mile titles at the Surry County Championships, MVAC Championships, Mid-West Regional Championships and earned All-State honors for the second year in a row at the NCHSAA 1A State Championships. An unselfish runner, this year at the MVAC Championships he sacrificed his individual races to anchor the 4X800 relay in order to help his teammates become conference champions, qualify for regionals and earn all-conference honors. The team was not favored to win or expected to win, but with Jacob running his fastest 800 ever he willed the team to victory. After the race he told me, “I am glad I could help my teammates win.” A typical response from one who possesses the heart of a champion. Even though throughout his career he battled nagging physical set-backs and various sicknesses, he captured awards and accolades too numerous to list. At this year’s Midwest Regional Track Championship Jacob found himself in a race that contained the five fastest two-milers in 1A state. Running a determined and superb race, he won running a PR, breaking the MW Regional record that had stood for 14 years, and posting the fastest time in the state for 1A. It was his third straight Midwest Regional Championship victory. One race remained…..the NCHSAA 1A State Championships. I always tell those I coach that there are never any guarantees at the state meet and that my job as a coach is to prepare you to be one of the three or four runners who actually has a chance to win, then you line up and race and see what happens. On Friday, May 20, not only battling fifteen other runners but also a sinus infection, the gun sounded to send the runners off. Jacob ran with guts and determination, leading the majority of the race. He ran with the heart of a champion. Only in the last 70 yards did he yield the lead to a withering finishing kick by a runner from Thomas Jefferson High (9:47), finishing his high school career in the runner-up spot in 9:49 a new PR and an Elkin High school record. One fact is certain, he left it all on the track…because he has the heart of a champion. As can be imagined, one who has the heart of a champion is never satisfied with anything other than first place. As Jacob stood on the awards podium to receive his silver medal I looked past the disappointment etched on his face because he didn’t win gold, and I saw what I had seen for four years…the heart of a champion who has always been a winner in every respect. I could not have been prouder for what he had accomplished and the much “stuff” he had overcome to be standing there. Running is truly a microcosm of life. You see, winning is not always about capturing the gold but having that heart of a champion who always gives their best and never gives up. One’s attitude and reaction to setbacks that so often occur in sports is an indicator of how one will react to such “stuff” that will without doubt occur in future areas of life. And occur they will. One who displays the heart of a champion in the face of adversity will go far in life and achieve much success. The heart of a champion never gives up no matter the odds or how difficult things may look. They look to overcome not quit. Jacob teaches us to keep working and be determined in our hearts that no matter the odds we find ourselves facing, with the Lord’s help, we will be successful if we stay “at it.” And staying “at it” is a quality one with the heart of a champion possesses. I am thankful I have had the privilege to coach someone like Jacob Parker who is a reminder of what can be achieved when one possesses the heart of a champion. On Saturday, May 3, the Elkin High School track team, which I am privileged to help coach, traveled to the Midwest 1A Regional Championships. One has to qualify to participate in a regional meet, then the top four finishers in each event at the regionals qualifies for the 1A State Championships the following week. Those top four places in each event are coveted spots athletes from twenty schools fiercely compete to capture. Elkin was expected to capture several top four positions. We did extremely well, with twelve boys and girls qualifying to make the trip to the state championship meet. 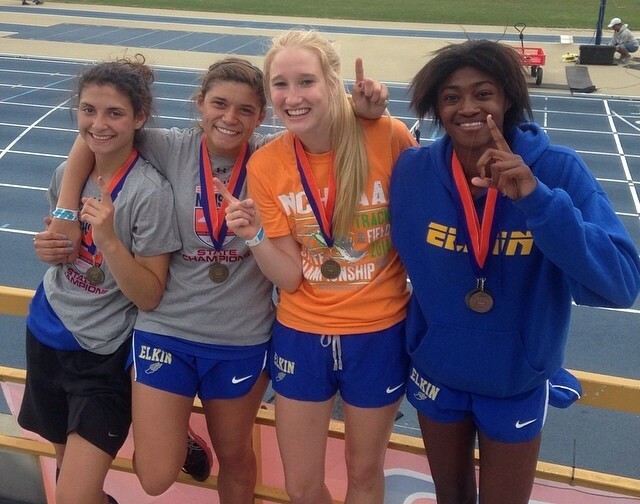 Though Elkin was most successful, there were two races in which Buckin’ Elk runners were disqualified forfeiting the right to advance to the state meet and the medals that would have been theirs. In the 4×800 relay the Elkin girls, who were ranked second in the state, were called for initiating interference with another runner in the homestretch and were unfortunately disqualified. In the boys 3200 meter run the Elkin runner ran a superb race to capture fourth, raising his hands in triumph as he crossed the finishline; a yearlong goal reached. His elation was quickly turned to shock, disbelief and tears after learning he had been disqualified for taking steps off the track after being jostled by another runner. Those two incidents were disappointments on an otherwise most successful day. According to the judges who made those calls, both disqualifications were the result of violations that were clearly spelled out in the rule book. Paul was speaking of His service to the Lord. Paul was careful not live in direct and intentional violation of the requirements of the Lord for his life lest he be disapproved or disqualified from being used in service by Him. Paul knew he had to abide by the rules if he was to be used effectively by the Lord, and if he didn’t he would be disqualified from being used by Him. In the same regard, when we live in direct and intentional violation of the Word of God, He will not use us. We can’t expect to be used by the Lord if we have unclean hands, an impure pure and feet that are walking in forbidden paths of deliberate disobedience (Ps. 24:4). If we are intentionally ignoring the “rule book” of the Word of God as it relates to our lives in regard to our relationship with Him, our fellowman and ourselves, we should not wonder that His hand in service and blessing is not upon us. Obviously I am not talking about living perfectly, for that is not possible, but I am talking about intentional consistency and commitment. Paul tells the loose living Corinthians in regard to being used of the Lord, “Moreover it is required in a servant that a man be found faithful” (I Cor. 4:2). Are we being faithful in our service? 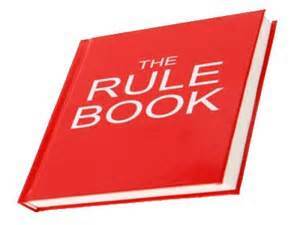 Are we abiding by the rules? Are we disciplined? Are we consistent in our living? Are we keeping our hands off the unclean things that will certainly bring about our demise in effective service to the Lord? Are we listening to the voice of our Heavenly Coach and keeping ourselves abreast of the truths in His Guide Book for our daily living and our spiritual health? If can’t we answer “yes” to these questions then why should we be surprised that we have been disqualified from effective service for the Lord and disapproved from all the rewards and blessings that go with faithfully and consistently abiding in Him. While the Elkin runners were temporarily disappointed for being disqualified, disappoint from disqualification from an earthly race can’t be compared to the spiritual anguish, regret and disappointment of being set aside in our service to the Lord. Let us remain faithful and heed the advice of John, “Abide in Him that when He shall appear we may have confidence and not be ashamed before Him at His coming” (I John 2:28).